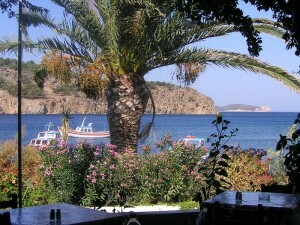 On Patmos you can savor plentiful fine restaurants and tavernas, situated on almost every area of the island. 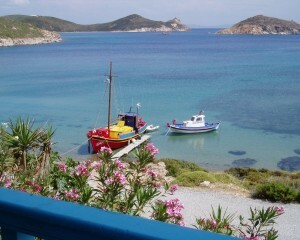 Skala and the Town of Patmos (Chora) conceivably enjoy the lion’s share, but bounteous seaside tavernas combining stunning views with ambrosial dishes are to be found right on the beach or literally next to the waves, all along the coastline, all within a 5-15 minutes drive from Patmos Villa Sophia. This ample variety of dining establishments ensures catering to every taste, from traditional Greek cuisine to gourmet meals, and some experts insist that the best Patmian dining can be traced not in Skála or Hóra, but out in the countryside – especially at the beaches. Greek cuisine, with its wide variety of high quality ingredients and its wisely considered and highly beneficial combinations which encapsulate the experience of centuries, enjoys a privileged position in the global culture of taste alternatives. Greece is characterized by its numerous islands and the rugged terrain of the mainland. This morphological diversity creates “worlds within worlds” and a trip to Greece means a fascinating exploration of tastes, flavours, unexpected combinations and endless variety. 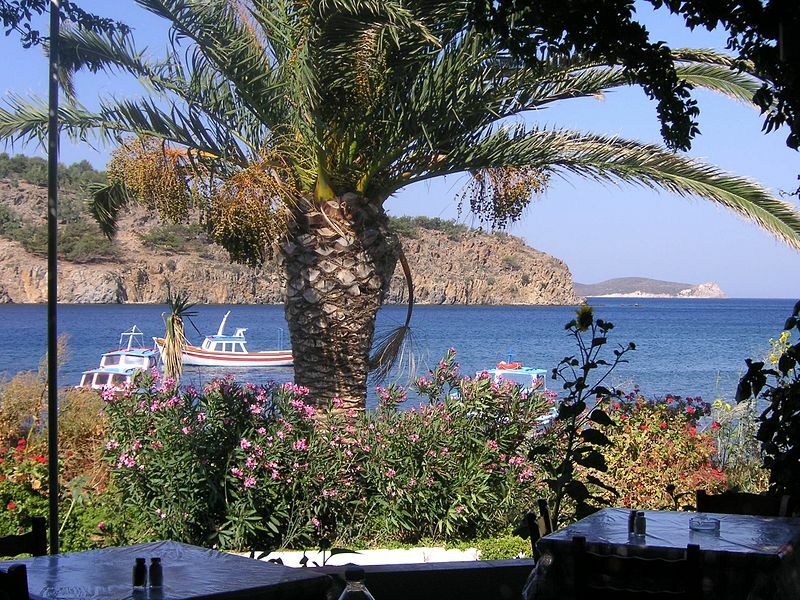 In Patmos, all of this is to be savoured to the fullest, at the best local restaurants, all conveniently located within a 2-10 kilometres drive from Patmos Villa Sophia. Common characteristics are the excellent raw ingredients and flavors specific to the country: oregano, thyme, bay leaves, rosemary, lemon, and, of course, olive oil. Fine meat produced by small farmers, fresh fish and seafood, dairy products which are accredited worldwide, healthy fresh vegetables served with brilliant wine, and mouth-watering fruits all serve to create a kaleidoscope of tastes. Creative chefs from Greece have made a definite impression at international events, helping to spread a wider appreciation of the local cuisine. Imaginative experiments with tried and tested recipes, unexpected combinations of exquisite ingredients combined with the use and renaissance of tradition, as creative modern Greek cuisine is lively and provocative, definitely establishes Greece as one of the shrines of the high culinary arts. The numerous islands of the Aegean that consist one of the largest and most important archipelagos in the world, were formed from the sun, the sea and the refreshing wind. The distinguishing microclimate of each island has contributed to the creation of unique products, some of which cannot be found anywhere else in the world. 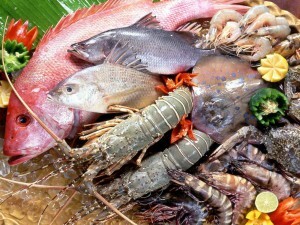 Thus, each island offers its own unique culinary paradise. The territories of the Dodecanese islands have always been at the heart of gastronomic history reflecting the meeting of cultures that occurred here. 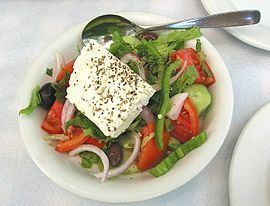 The Dodecanese cuisine is particularly rich and varied. Stuffed baby goat or ‘kapamas’, ‘boukounies’ (pork cooked in various herbs) as well as the excellent sweets and desserts, such as ‘xerotigana’ (fried spiral pastries in syrup or honey) and ‘pastelaries’ (dried figs with almonds and sesame seeds) are only a few of the culinary delights to be enjoyed here. 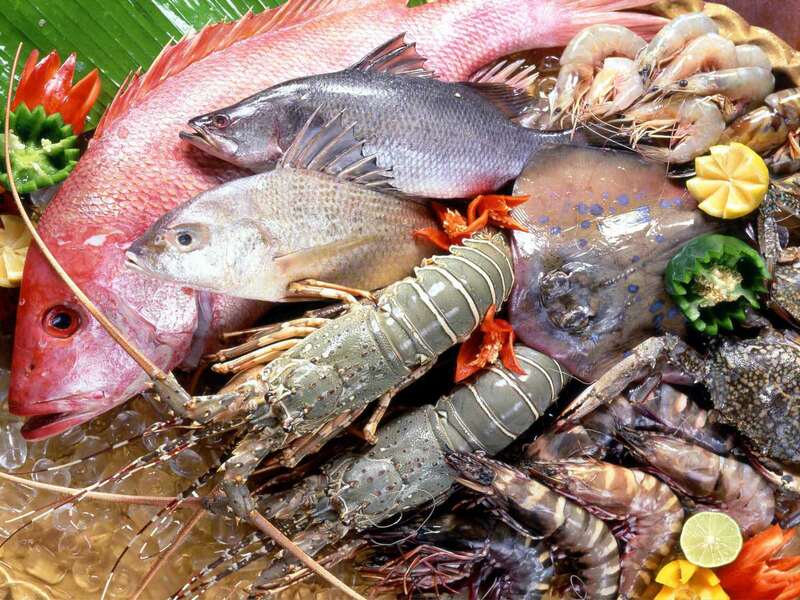 Other local specialties include different dishes of fish and seafood such as squid stuffed with rice, a specialty also known to most islands of the Dodecanese, octopus stew and octopus grilled as well as local cheeses and sweets. With its distinctive character, heady aromas, and fruit and vegetables ripened in bright sun, it is a separate chapter of the Greek gastronomic tradition and indeed of international culinary history. The famous Aegean ‘makarounes’ (hand-made fresh pasta with caramelized onions), Kassian pilaf, ‘sgardoumia’ (offal soup) from Santorini, Karpathos ‘vyzanti’ (stuffed lamb or goat with bulghur wheat cooked in a wood-burning oven), ‘marathotiganites’ (fennel rissoles), ‘dolmadakia’ made with vine leaves and herbs, ‘melitera’ (sweet cheese pies with vanilla) and ‘melopita’ (honey pie), are some of the thousands of dishes that can be sampled by the traveller in the warm embrace of the primordial sea. The beauty of its islands has become a tourist attraction not only for travellers but also for people involved creatively in the culinary arts, who come here to expand their knowledge and show their love of Greek cuisine. The restaurants on each islands occupy a prominent place in international rankings and are highly respected by devotees of haute cuisine and authentic eating experiences. Greece also has a strong tradition of meat in “karvouna”, that is, ‘dry’ cooked over charcoal or flame, or roasted on the spit. The great spring celebration of Easter is celebrated by everyone, to the accompaniment of delicious lamb or goat dishes. 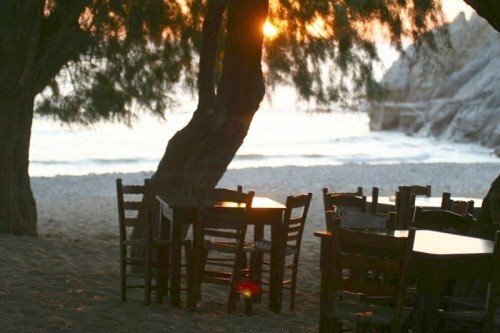 The adjacent to the Dodecanese uniquely Mediterranean island of Crete, with its long history, seductive natural surroundings and proud inhabitants offers great excitement as an authentic gastronomic experience. The traditional pilaf rice of Chania prepared with rooster or beef, the famous “ofto” roasted baby goat which is served almost everywhere in Crete, fresh salads and traditional ‘dakos’ (barley rusks with fresh tomato, soft white cheese and olive oil) are just some of the recipes of traditional Cretan cuisine. Furthermore, the flavours of the Ionian Islands, with their Italian names and distinctive character, form a separate chapter in the Greek culinary arts. ‘Savoro’, which means “sour”, is a wonderful recipe with rosemary and vinegar widely used in the Ionian Islands to season and preserve fish, as well as vegetables and is also applied in Patmos with its equally important Italian background. ‘Bourdetto’ (scorpion fish cooked in a red-hot spicy tomato sauce), ‘sofrito’ (veal steak slow cooked in a white wine, garlic and herb sauce), ‘pastitsada’ (braised beef, pork or rooster in a spicy cinnamon tomato sauce usually served with rigatoni pasta), ‘stifado’ (beef stew with baby onions), ‘strapatsada’ (scrambled eggs with tomato and feta), ‘tsigareli’ (wild greens or cabbage in spicy tomato sauce), ‘pastitsio tis nonas’ (baked pasta and mince with a béchamel sauce topping), ‘bakaliaros me agiada’ (de-salted preserved codfish fillets with ‘skordalia’ garlic sauce) are some of the recipes that incorporate centuries of history and culture. Superb wines and unique drinks and beverages like kumquat liqueur and ginger beer, and desserts and sweets such as ‘pantespani’ syrup-soaked sponge cakes, ‘mandola’ nougat and ‘pasteli’ sesame seed and honey bars accompany the rich yet delicate gastronomic cultural traditions of Greek cuisine. Traditional pastry pies are another large chapter in Greek cuisine, where many different processes are followed, which give the pastry a wide variety of consistencies, sometimes thin translucent sheets, and sometimes more crumbly and richer. 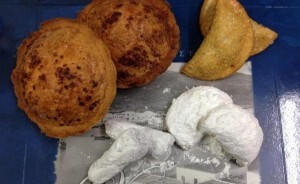 With these pastries the local imagination has created a seemingly endless number of delicious combinations. 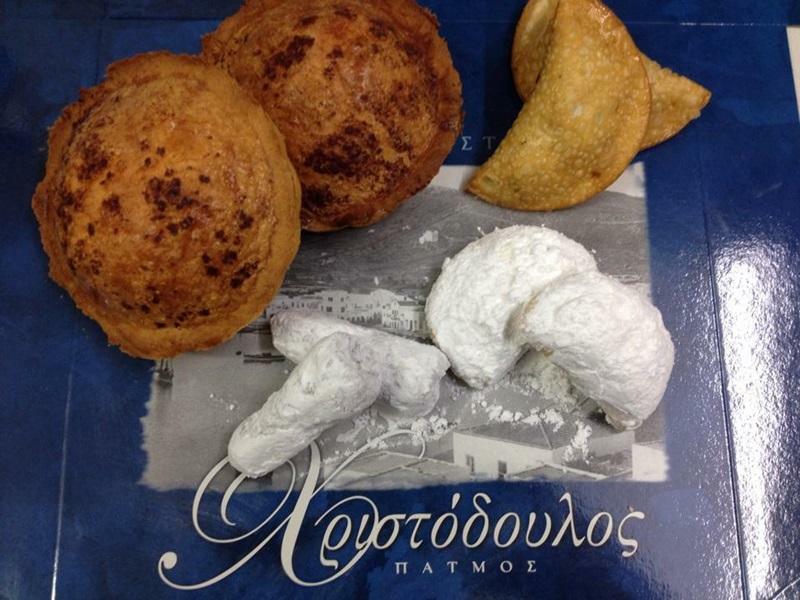 Savoury pies with cheese, wild greens and herbs and meats, or sweet, with milk, rice, cinnamon or yogurt – the possibilities are inexhaustible and they can easily be enjoyed at the best Patmos pastry shops, all conveniently located within a few miles distance from Patmos Villa Sophia. Each corner of Greece makes its own pies, either baked or pan-cooked and they are the essential accompaniment to the richly laid table and have pride of place in every local cuisine. The most refined dining establishment offering Greek and international cuisine. 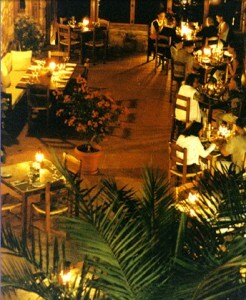 A typically Greek picturesque joint serving a variety of traditional dishes, usually at more modest prices. A magherio is a tavern that specializes is cooked dishes and if you are looking for yummy pastitio, mousaka or other backed and casserole dishes at the best value for money , this is your place. We knead all the ingredients together to make the cheese pie dough. As soon as we knead it we leave it for a while to “rest”. Then we roll out “fillo” layer 5mm thick and spread it in a round baking pan. At the same time we grate the 800gr local “myzithra” cheese and the 800gr fresh local cheese and stir with 15 local eggs. Next we add 1 teaspoon local rose water and a little cinnamon. Finally we put the filling in the baking pan after we have spread the “fillo” and bake at 200 degrees for 50 minutes.